Hey mate, has your sync rate changed at all? Nice ping.. Seems everyone is requesting the change now lol =). I guess thats the only risk with longer lines you might actually lose some download performance for the lower latency. I think people on shorter lines experience the opposite however. It's whatever you're happy with tho. Personally I'd always sacrifice some speed for lower latency. But thats just me. What sort of distance from cabinet are you? lol well this is catch 22 everything from digital region says 400 meters (correct if i walk to it) the line lengh is about 1.2km to my house i've also been told many of times i have 1 of the best connections for the distance i am based on my upload speed. I'm almost certain all speed estimates are based on line of sight to the cabinet NOT actual line length. 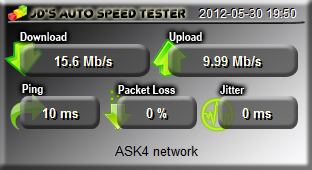 I know for a fact my line is longer than Origin quoted (by about 100m), and THAT value was meant to be what BT quoted.